, one of the ablest French writers of the last century, was born at Paris, Nov. 20, 1739. His father, an officer of the artillery, died when he was very young, and left him in poverty. He obtained, however, the patronage of M. Asselin, principal of the college of Harcourt, who conceived an affection for him, received him among his pupils, and soon after obtained a pension for him. During his education he displayed a turn for poetry and satire, and was accused of writing a satirical poem on his benefactor. He protested his innocence and his reverence for M. Asselin; but this not appearing satisfactory, he was confined for some months in a house of correction. One of his biographers says in the Bastille; but, wherever it was, we are told that it made a deep impression on him. 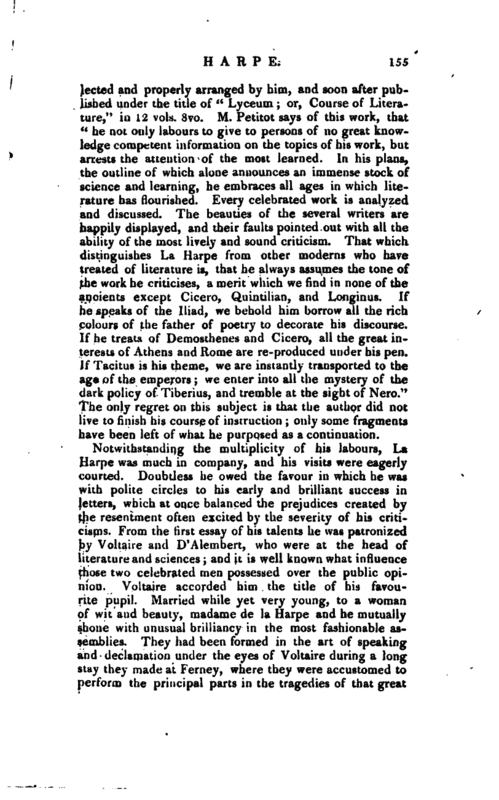 His first poetical productions after this affair, were of a species then very fashionable, and called Heroides, in which Colordeau, Ranee, and Dorat had distinguished themselves, and La Harpe was thought little inferior to Dorat. In 1763, when only in his twenty-fourth year, he wrote his tragedy of “Warwick,” which met with deserved success, and still preserves its popularity on the stage. 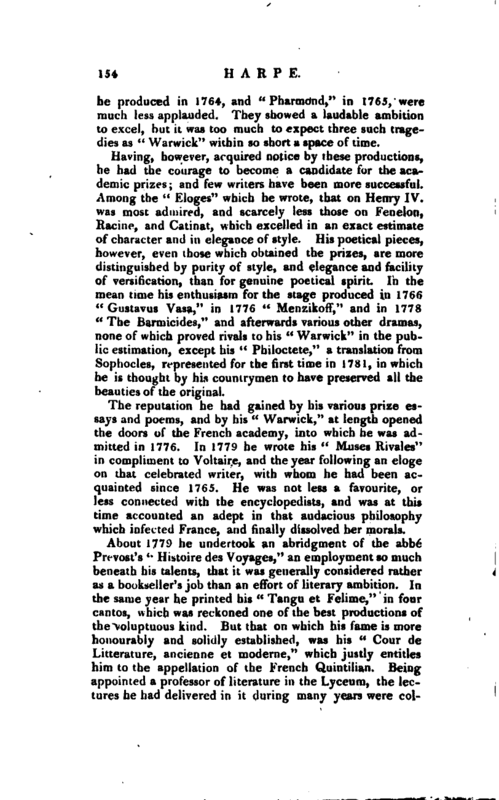 “Timoleon,” which | he produced in 1764, and “Pharmond,” in 1765, were much less applauded. They showed a laudable ambition to excel, but it was too much to expect three such tragedies as “Warwick” within so short a space of time. Having, however, acquired notice by these productions, he had the courage to become a candidate for the academic prizes; and few writers have been more successful. Among the “Eloges” which he wrote, that on Henry IV. was most admired, and scarcely less those on Fenelon, Racine, and Catinat, which excelled in an exact estimate of character and in elegance of style. His poetical pieces, however, even those which obtained the prizes, are more distinguished by purity of style, and elegance and facility of versification, than for genuine poetical spirit. In the mean time his enthusiasm for the stage produced in 1766 “Gustavus Vasa,” in 1776 “MenzikofT,” and in 1778 “The Barmicides,” and afterwards various other dramas, none of which proved rivals to his “Warwick” in the public estimation, except his “Philoctete,” a translation from Sophocles, represented for the first time in 1781, in which he is thought by his countrymen to have preserved all the beauties of the original. The reputation he had gained by his various prize essays and poems, and by his “Warwick,” at length opened the doors of the French academy, into which he was admitted in 1776. In 1779 he wrote his “Muses Rivales” in compliment to Voltaire, and the year following an eloge on that celebrated writer, with whom he had been acquainted since 1765. He was not less a favourite, or less connected with the encyclopedists, and was at this time accounted an adept in that audacious philosophy which infected France, and finally dissolved her morals. 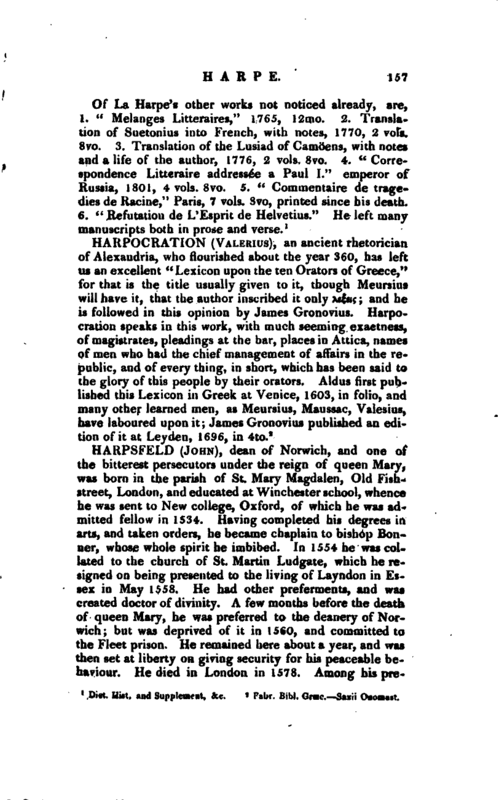 About 1779 he undertook an abridgment of the abbe“Prevost’s Histoire des Voyages,” an employment so much beneath his talents, that it was generally considered rather as a bookseller’s job than an effort of literary ambition. In the same year he printed his “Tangu et Felime,” in four cantos, which was reckoned one of the best productions of the voluptuous kind. But that on which his fame is more honourably and solidly established, was his “Cour de Litterature, ancienne et moderne,” which justly entitles him to the appellation of the French Quintilian. Being appointed a professor of literature in the Lyceum, the lectures he had delivered in it during many years were | collected and properly arranged by him, and soon after published under the title of “Lyceum; or, Course of Literature,” in 12 vols. 8vo. M. Petitot says of this work, that “he not only labours to give to persons of no great knowledge competent information on the topics of his work, but arrests the attention of the most learned. In his plans, the outline of which alone announces an immense stock of science and learning, he embraces all ages in which literature has flourished. Every celebrated work is analyzed and discussed. The beauties of the several writers are happily displayed, and their faults pointed out with all the ability of the most lively and sound criticism. That which distinguishes La Harpe from other moderns who have treated of literature is, that he always assumes the tone of the work he criticises, a merit which we find in none of the ancients except Cicero, Quintilian, and Longinus. If he speaks of the Iliad, we behold him borrow all the rich colours of the father of poetry to decorate his discourse. If he treats of Demosthenes and Cicero, all the great interests of Athens and Rome are re-produced under his pen. If Tacitus is his theme, we are instantly transported to the age of the emperors; we enter into all the mystery of the dark policy of Tiberius, and tremble at the sight of Nero.” The only regret on this subject is that the author did not live to finish his course of instruction; only some fragments have been left of what he purposed as a continuation. 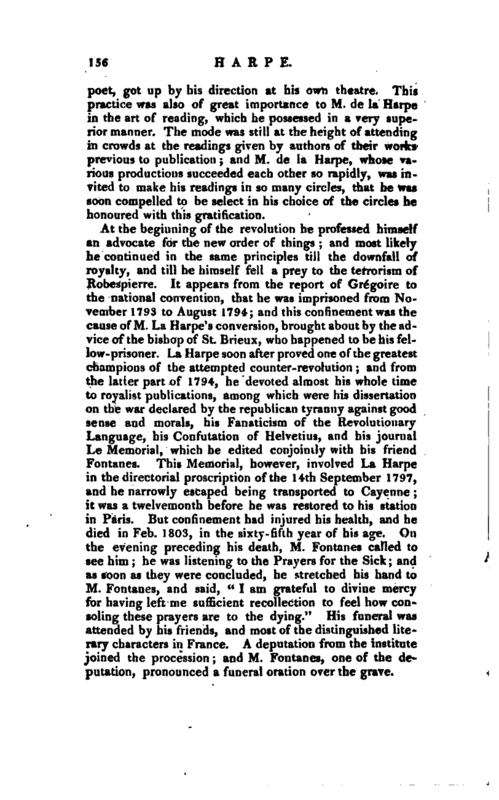 Notwithstanding the multiplicity of his labours, La Harpe was much in company, and his visits were eagerly courted. Doubtless he owed the favour in which he was with polite circles to his early and brilliant success in letters, which at once balanced the prejudices created by the resentment often excited by the severity of his criticisms. From the first essay of his talents he was patronized by Voltaire and D’Alembert, who were at the head of literature and sciences; and it is well known what influence those two celebrated men possessed over the public opinion. VoUaire accorded him the title of his favourite pupil. Married while yet very young, to a woman of wit and beauty, madame de la Harpe and he mutually shone with unusual brilliancy in the most fashionable assemblies. They had been formed in the art of speaking and declamation under the eyes of Voltaire during a long stay they made at Ferney, where they were accustomed to perform the principal parts in the tragedies of that great | poet, got up by his direction at his own theatre. This practice was also of great importance to M. de la Harpe in the art of reading, which he possessed in a very superior manner. 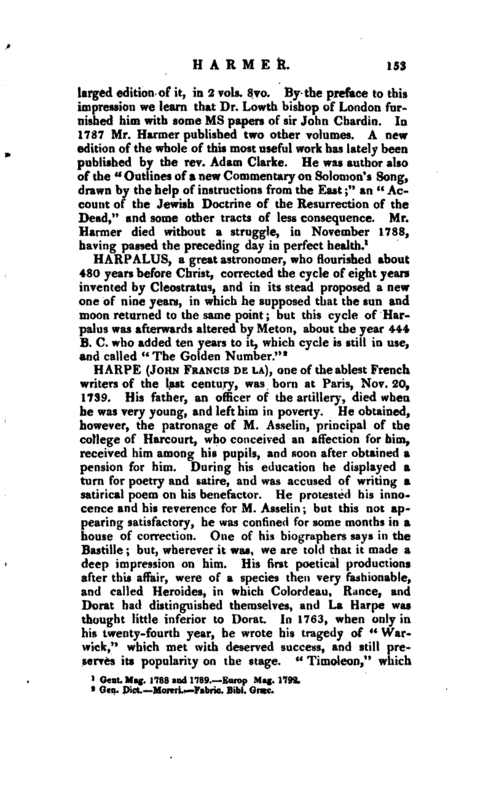 The mode was still at the height of attending in crowds at the readings given by authors of their works previous to publication; and M. de Ja Harpe, whose various productions succeeded each other so rapidly, was invited to make his readings in so many circles, that he was soon compelled to be select in his choice of the circles he honoured with this gratification. Dict. Hist. and Supplement, &o.